When run, UpdatableDataBindingGrid.p creates a Infragistics.Win.UltraWinGrid.UltraGrid that displays hierarchical data from a ProDataSet on the Customer, Order, and Orderline tables, as shown in the following figure. The application's event logic can handle adding, deleting, and editing records. For information on using the sample applications for this manual, see Example procedures. 1. Run UpdatableDataBindingGrid.p with the Sports2000 database attached. 2. 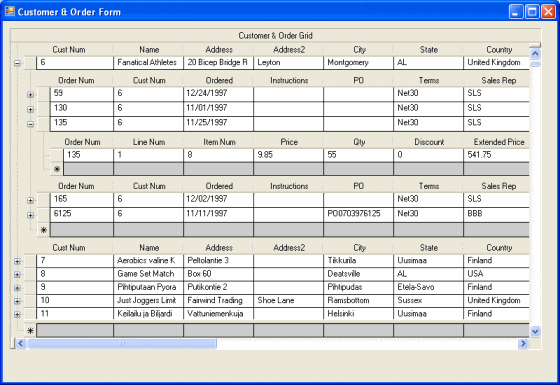 Select CustNum 6 and expand the child grids to display an order and its orderlines. Obviously, in a business application, the event logic would perform some additional steps, such as incrementing the Line Num field. The sections that follow examine the inner workings of this procedure.